In Ancient Greece, the goddess Themis was the personification of law and order, and was widely recognised as the Greek goddess of Justice. 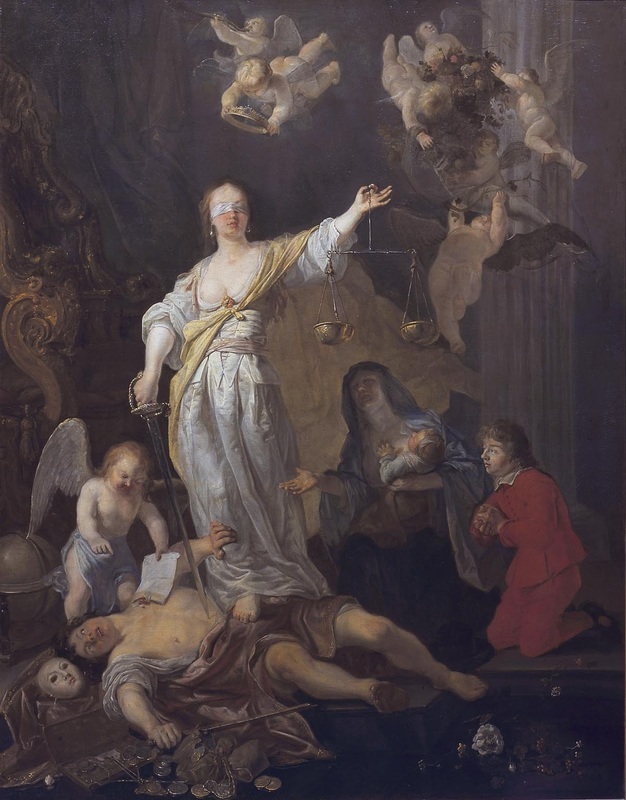 As such, Themis would prove to be an important goddess in guiding how society worked, and even today the imagery of Themis, a female goddess with sword and scales of justice in hand live on today. The goddess Themis was a female Titan, a goddess from the generation before Zeus. 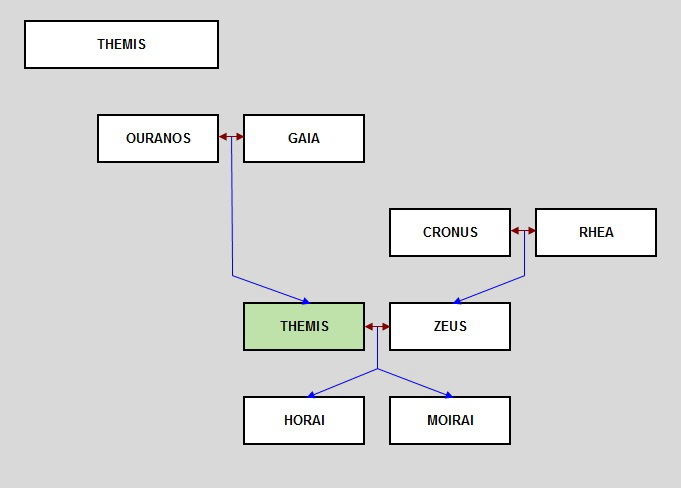 As a Titan Themis was considered to be one of the twelve children of Ournaos and Gaia, there being six sons and six daughters. The male Titans would rise up their father, and Cronos would take up the position of supreme god of the cosmos in place of Ouranos. The female Titans would also benefit from the insurrection, for under the rule of Cronus each Titan was given a privileged position. Themis would become to be known as the goddess of Divine Law and Order, and therefore Themis was the Greek goddess of Justice. In this role, Themis was considered to be the goddess who provided man with the rules by which they should lead their lives. Themis would therefore work hand in hand with the Greek goddess Nemesis, for whilst Themis issued the laws, Nemesis would ensure that they were being followed. Themis though was not simply associated with Law and Order, for Themis was also one of the Greek goddesses closely linked to the Oracles of Ancient Greece. Originally, the Oracles were held to be sacred to Gaia, but the Protogenoi passed control of them onto Themis and her sister Phoebe. Prophecies were of course important in many Greek mythological tales, and in some tales it was Themis who warned her nephews Prometheus and Epimetheus not to fight against Zeus during the Titanomachy; although Prometheus is generally considered to have foreseen the outcome himself. For a time therefore Themis was revered as a goddess of prophecies, although eventually the ownership of the Oracles of Ancient Greece would pass to Apollo. Apollo would kill the Python at Delphi to symbolise this change of ownership, but even when Apollo was worshipped, Themis was still closely linked with the various Oracles. The rule of the Titans would come to an end when Zeus emerged successful after the Titanomachy. During the War of the Titans, the female Titans remained neutral and so were not punished by Zeus, unlike the majority of male Titans. The rise of Zeus saw many of the older gods and goddesses become marginalised, with the Olympians now taking over the roles. 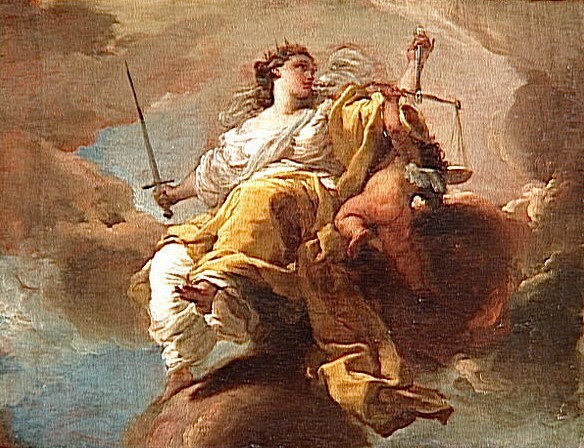 Under the leadership of Zeus though, Themis kept her revered position as the Greek Goddess of Justice, and found herself installed upon Mount Olympus. Zeus and Themis would become close and it was said that Themis would become the second wife of Zeus, after Zeus had swallowed Metis his first wife. The union of Themis and Zeus was said to have brought forth two sets of children, the three Horai and the three Moirai. In Greek mythology the first generation of Horai were three sisters named Dike, Eirene, and Eunomia. The Horai were primarily goddesses of the season, but were also closely associated with the division of time, and thus in both roles were considered to be goddesses of order, just like their mother. The Moirai are also often referred to as the Fates, and they like the Horai were three sisters, Atropos, Clotho and Lachesis. The Moirai were in control of the life thread of all mortals, and even gods were guided by them. The relationship of Themis and Zeus would eventually come to an end, for famously, later on Hera would become wife of Zeus. The fate of Themis though was nothing like Metis, and even after Zeus and Themis were separated, Themis remained a revered goddess, with Themis offering guidance to her former husband, and even plotting with Zeus. In some versions of the tale of the Trojan War, it was Zeus and Themis who planned the whole war to bring an end to the Age of Heroes, a plan that started with Eris throwing the Golden Apple, to the Sacking of Troy.